This entry was posted in 1727 NW Hoyt (2017), Nature Conservancy, Nesika Illahee, Oregon Harbor of Hope, Portland Diamond Project, Providence Park Expansion, The Marilyn, weekly roundup. Bookmark the permalink. Didn’t the Portland Diamond Project promise a few months ago to also develop 1000’s of infill housing units with the project? I don’t see that anywhere now. Plus, this location for 30,000 attendees to get to would be just awful. I’m not a MLB fan so it won’t be me, but good luck with getting there and out of there by car, bus, streetcar or even bike. But don’t look at it that way. 20 years ago did anybody imagine the Pearl District would be the way it is? In fact, folks were saying “what?! That drug infested warehouse district being a rich condo district? !” But with time and planning it completely transformed. This stadium district will be the same 20 years from now. It’s nearly already next to the fast changing Slabtown district. Have you guys seen that area by the new grocery store New Seasons where the Conway buildings use to be? It’s creeping more and more north towards terminal 2 anyways..
Twenty years ago the Pearl District was already well under construction. It had been targeted for residential development since the mid-eighties. Do we really need another stadium when where have Jeld-Wynn Field or whatever the hell it’s called these days? Also, upgrading roads in this area would mean making them less pedestrian oriented as “upgrading” nearly always means making them wider and increasing speeds. Isn’t that contrary to the city’s goals on numerous fronts? It’s also worth pointing out that just down the street are a bunch of new apartments. I don’t think the people would like the stroad in front of them being made more like a highway. It’s busy and loud enough as it is. As for transit, it hosts the 16 bus line. It’s the fastest was from St. Johns to Downtown Portland. It’s actually a pretty good bus line with direct connections to all the MAX lines in Downtown. It’s just not that frequent, though. Front Ave, which becomes Naito in Downtown, has to cross the railroad tracks new Union Station. Freight trains already wreck havoc in this area regularly. I’m not sure putting in a stadium for almost 40,000 people is a good idea. Also, it’s waterfront property. Wouldn’t new homes be better? We need those far more than a stadium for a major league team that we don’t even have. Living on the water is so nice, so why take it away, even if it’s likely only to be affordable only to people of means? This just seems like a bad idea no matter how you look at it. As suggested in an Oregonian article, there are better sites for a baseball stadium that includes adjacent higher density housing. Gateway was the first listed; transit service makes it a no-brainer with all of the MAX and bus lines converging there. Wow, Gateway could finally be the hub that has been long envisioned! 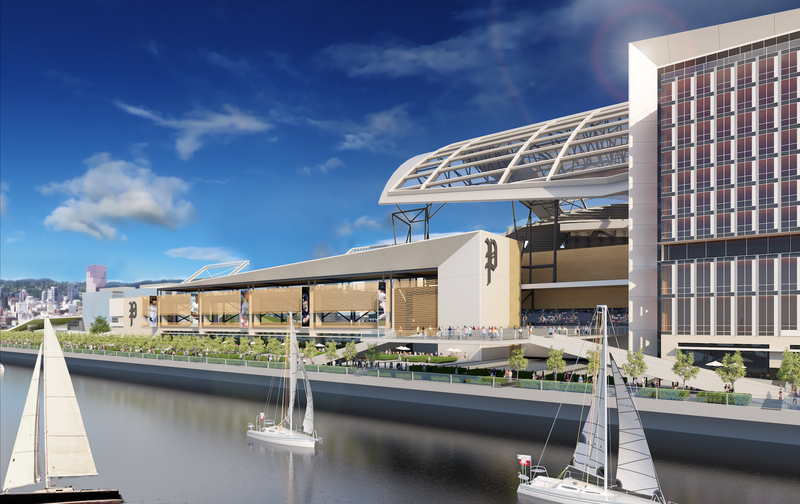 I also think a stadium on the former Zidell property in S. Waterfront would provide a beautiful waterfront location too, and there is MAX and Streetcar service there. The Washington National stadium was built in an area along the Anacostia River that was a similar ghost town back when I was living and working in DC back in the mid-90s. Now it is a happening area with a metro line and surrounded by new development. While a stadium next to the MODA center might have made more sense for transit, it would have made the most congested section of the city much worse during 80 or so days a year. Putting a stadium out there will mess up Highway 30 and will back up onto 405. But it will have less impact on locals than a stadium in the MODA center area that will bring both I-5 and I-84 to a halt. I think baseball is somewhat different from the Timbers. The fan base is likely to be MUCH more regional and suburban and likely to generate a lot more car traffic no matter where the stadium is put. I’m happy with the location, but I REALLY hope the design drastically changes to something less “shiny” and more human, along the lines of Wrigley Field or Oriole Park.